Mobile Cooking Romania is an innovative tourism product that combines sightseeing of spectacular places with tasting of culinary treasures of the Carpathian garden. We offer thematic gourmet cooking classes and “haute cuisine” events with international experienced chefs and sommeliers at spectacular places in Romania. A special mobile kitchen device and transport system allow us to offer these events at extraordinary places in castles, in the Carpathian mountains, in the vineyards or somewhere in the wild forests. 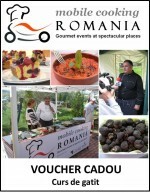 Mobile Cooking Romania events, together with an additional tourism programme (i.e. sightseeing, guided tours, truffle hunting), provide an exceptional tourism experience.